Our house is done! The final inspection passed and it is all because of William Jones, the licensed carpenter that did most of the work on it. William started working in February. 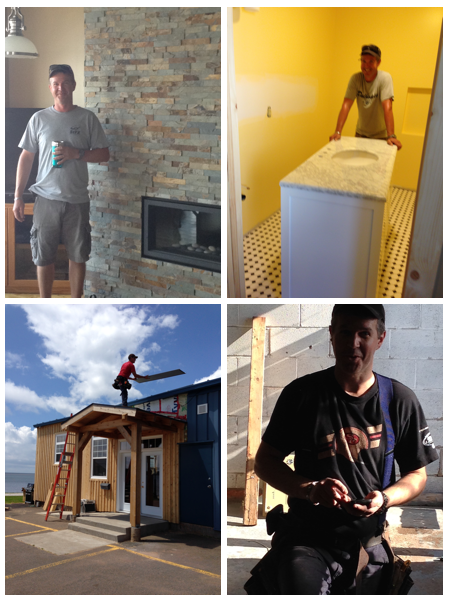 Dennis had arrived in Summerside to start the demolition and William started working with Dennis two weeks after that. The two of them got along really well. Dennis realized very quickly how lucky he was to work with a guy like William. He is very efficient and does meticulous work but also had some great stories to tell Dennis during the long, cold month of February. Because we didn’t know much about Summerside and the contractors and everything that has to do with building a house, William basically took over and got us through the entire process. He hired most of the subcontractors. The people that he hired were all excellent and did their best to help make the house as nice as it is. We were very grateful because it made it a lot easier for us, especially being so far away for a lot of the construction. William got his carpentry license in a very interesting way. He did not go to school for carpentry at all. He went to Holland College in Charlottetown for electrical engineering but according to him, he spent quite a bit of the year socializing as it was his first year away from home. He finished the year but then switched courses to construction technology. He got a job right away in an office reading blueprints and working on projects but only lasted four days. His boss noticed that he didn’t really like what he was doing and asked him if would rather work downstairs in the construction area. He did and never looked back. He worked for a number of different places and eventually decided to apply for his carpentry license. He challenged the license board because he didn’t want to go back to school as he had a lot of practical experience (and probably knew more than the instructors). The board told him that he needed 10,000 hours of construction work and had to write an exam. He fulfilled both of those requirements and got 85% on the exam. William now works independently – he owns his own business – William’s Woodworking. We were lucky to get him because as I said earlier, he does excellent work. His favourite part of a job though, is the finishing work and that was a good thing for us as both of our previous houses had no trim until two weeks before we moved out. He is able though, to do everything and quite often suggested options for finishing a particular part of the job. We almost always agreed with his suggestions. William also had a few stories to tell and often during a break, he would tell them to Dennis who got quite a PEI education! He learned a lot from William – things such as lobster fishing which was important to learn especially when navigating a sailboat through the lobster pots. He also told us that we could go clam digging by using a plunger (we still think he’s pulling our leg on that) and how a fisherman would pull a trick on his buddies by putting a fork in his boot. Apparently, you can’t pull your foot out without jamming the fork into it so you have to cut the boot (we have not tested this and most likely won’t!). William is married to Carla who is nurse at the hospital. She works in the nursery. William told me the other day that he traded in his motorcycle for an engagement ring – which was a very good decision. William and Carla have three little boys and a dog. I think their life is very, very busy. I was riding my bike one day past their house and William had all three boys working outside. Owen, who is going into grade 4, was mowing the lawn and the two younger boys (Iain and Thomas) were scraping the driveway. They seemed very happy to be working with their dad. We have thoroughly enjoyed working with William over the past six months. He not only is a good carpenter, but is also a good person and was always thoughtful and considerate. What I really liked was that he kind of kept his eye on Dennis to make sure that he was ok. He is trying to give him the nickname Skipper (with mixed results) and the two of them had good talks about boats, wood and other important parts of life. If William lived elsewhere in Canada, say Muskoka for example, he would be able to be paid twice the amount of money and there would most likely be a long waiting list to hire him but I think he enjoys his life on the island (who wouldn’t?) We are very fortunate to work with him. 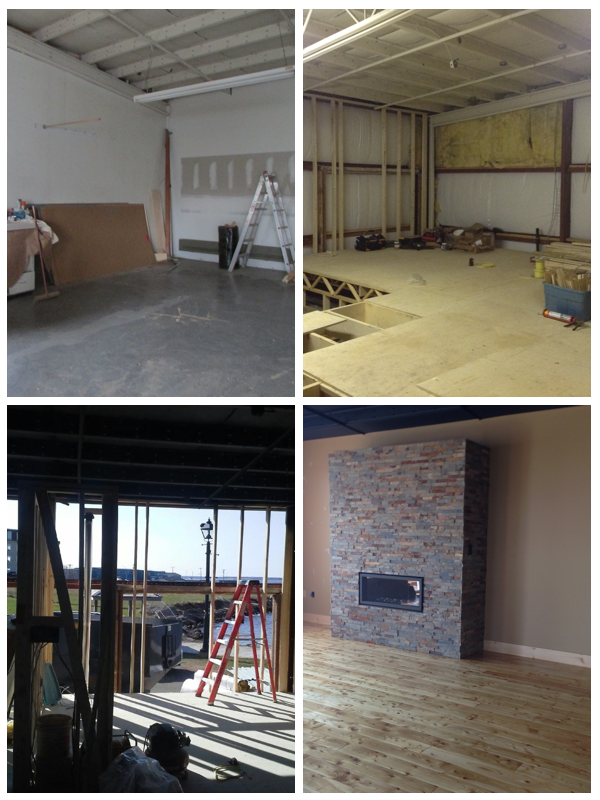 He’s made this place into a home and as you can see by the pictures below, it was no easy task! So the house is done and as I said earlier, it is because of William. He has done a fantastic job. I hope he enjoyed working on the house, I’m sure it was a challenge! I am sure that it is a great relief for all that the job is complete and everyone can move on to the next project. When building my house, I too was fortunate enough to have the right people involved to make the project a quality result. Working around other people’s homes on a regular basis, I do see some flaws in the way some homes are built.